The Woodleigh Residences sold 60 per cent of the 50 units released for sale during the soft launch, which prompted joint developers Kajima Development and Singapore Press Holdings to release another 50 units. The developers said that units sold over the weekend achieved an average of above $2,000 per square foot. The Woodleigh Residences is a 99-year-leasehold property comprising of two-, three-, and four-bedroom units, which start at $1,873 per square feet (psf). A two bedroom apartment has a starting price of $1.088 million, while the four-bedroom units are $2.55 million onwards. Kajima-SPH first released 50 units in response to growing interest for The Woodleigh Residences, of which about 60 per cent were booked during the preview. “Given the current challenging property market condition, we were encouraged by the response and released another 50 units,” said Kazunori Ichihashi, Kajima Development’s project director. The developers said that those who had issued blank cheques two weeks ago to indicate their interest in the premium project turned up for a ballot at 11am on Saturday for a chance to choose their units. The doors were open to the public that same day at 1pm. The launch attracted buyers such as families, HDB upgraders, as well as parents buying for their children in trust. Buyers, as expected, turned out to be mainly Singaporean. The Woodleigh Residences developers said in their Facebook that their sales gallery will close from 19 November 2018, in preparation for the official launch in early 2019, and that their soft-launch prices will still be offered to the public who are keen to make a purchase before 19 November 2018. 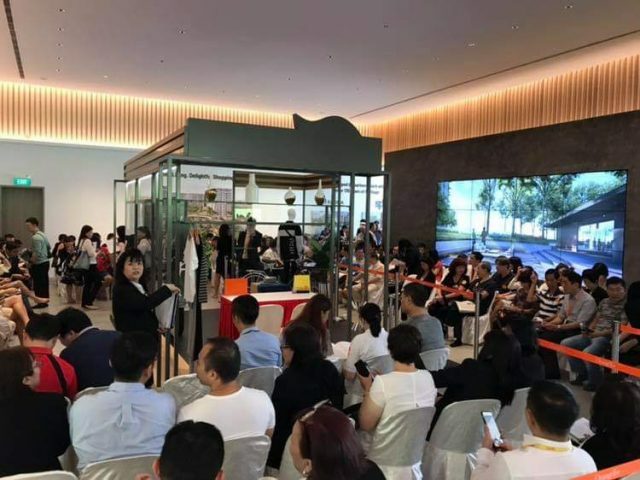 The developers Woodleigh Residences invited members of the public to drop by our sales gallery beside NEX Shopping Mall (along Serangoon Link) this week to secure their soft-launch prices before it ends. The Woodleigh Residences is the latest and most ambitious integrated premium housing project of Japanese property developer, Kajima Development Private Limited (‘Kajima’), and Asia’s leading media organisation, Singapore Press Holdings Limited (‘SPH’). Located at the junction of Upper Serangoon and Upper Aljunied Road, this premium housing project sits on 25,440 sqm of land and is Bidadari’s only integrated development with residences built above The Woodleigh Mall, as well as a transportation hub with an MRT station and linkway to Singapore’s first underground bus interchange. It is also integrated with a neighbourhood police post and a community club, offering a complete and convenient living experience. Residents of Woodleigh Residences will enjoy direct access to Woodleigh MRT Station and Singapore’s first air-conditioned underground bus interchange. As part of community building, Kajima and SPH will work with the People’s Association and the Singapore Police Force to build a 6,000 sqm Community Club and a 2,190 sqm Neighbourhood Police Centre in the integrated development. The Woodleigh Residences itself will boast 667 premium residences overlooking the tranquil Alkaff Lake and Bidadari Park, while The Woodleigh Mall will have close to 28,000 sqm of retail, dining and commercial space, including a supermarket. Considered as the Jewel of Bidadari Estate Master Plan, Woodleigh Residences is well-placed to be the heartbeat of Bidadari as the Master Plan unfolds. It is well-positioned to benefit from the area’s development and will also be the heartbeat of Bidadari’s ‘A Community in a Garden’ concept. Being sited right by a lake and parkland will allow residents to enjoy picturesque views of Alkaff Lake and Bidadari Park. Its excellent location at the city fringe with major expressways only minutes away has made Bidadari one of the most sought-after new housing estates in Singapore, with its sale of Build-To-Order (BTO) flats receiving overwhelming reception. As such, residents also stand to benefit from a large pool of future potential resale buyers as well as capital gains. The Woodleigh Residences is also within a 1-2 km catchment of popular primary, secondary and international schools. These include St. Andrew’s Village with its primary and secondary schools and junior college, Maris Stella High School, Cedar Primary School and Stamford American International School. The Woodleigh Residences is the perfect showcase of the time-honoured tradition of Japanese craftsmanship. Each of its 2- to 4-bedroom residences will bear the Japanese hallmarks of intricate and clean-cut designs as well as a meticulous attention to detail. These range from thoughtful, space-maximising functions to the seamless, flushed flooring from living room to balcony that extends usable space, evoking a sense of spatial freedom and allowing spectacular, uninterrupted views of the lake and gardens. On the condominium grounds, pools, lagoons and pavilions are carefully interspersed with a sunken BBQ courtyard, lush gardens, gourmet and alfresco kitchens and tatami rooms to create an immersive environment. There will also be a well-equipped gym, an onsen overlooking Bidadari Park and Alkaff Lake and an Urban Farming Area. The development is expected to be completed by 31 August 2022.